Doreen Green has been messing up the Marvel universe for years. 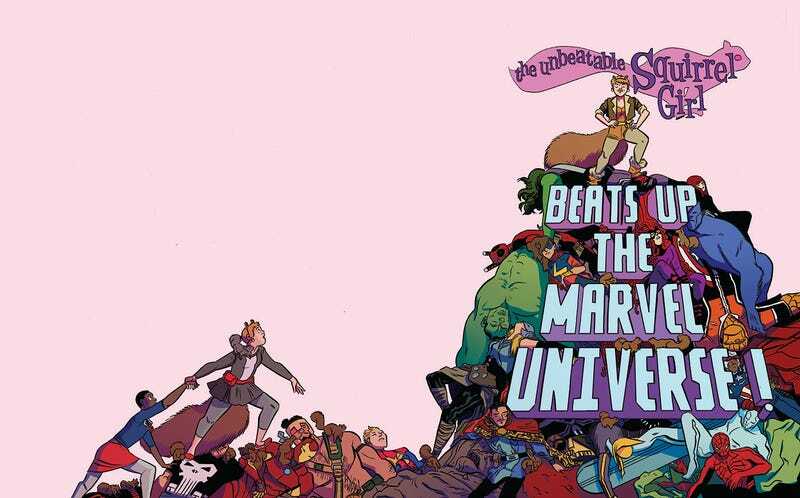 Earlier this month, Marvel announced a live-action adaptation of Ryan North and Erica Henderson’s Unbeatable Squirrel Girl comics. Half of Marvel’s fandom is psyched about the upcoming addition to the MCU, and the other half seems pretty pissed off. What’s so offensive about a girl who has the “proportional speed and strength of a squirrel”? Well, it depends on how you like your superheroes. Squirrel Girl, aka Doreen Green, is a young woman whose presence in Marvel comics suggests that superheroes’ violent tactics aren’t the smartest in every situation. She jokes about beating up villains, but ultimately, she “defeats” the strongest and scariest of Marvel’s baddies by appealing to their humanity and making them into her friends. Bro: Squirrel Girl is just a joke character she has no business in the marvel universe!!! 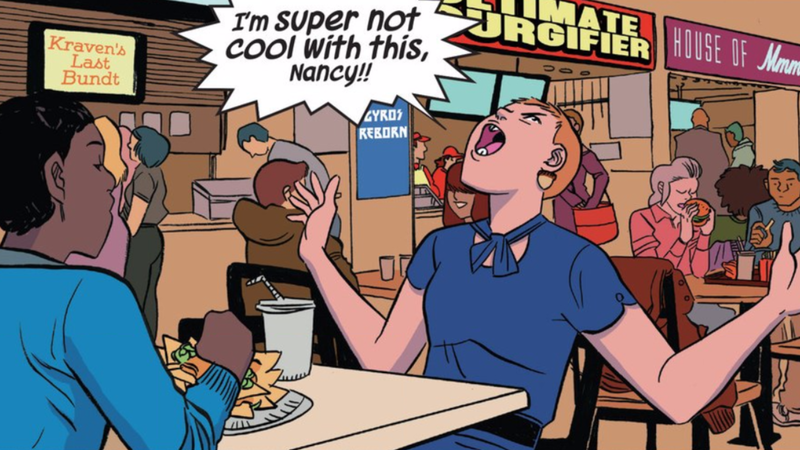 The central message of Squirrel Girl’s recent comics — which are aimed at a YA audience along with Patsy Walker, aka Hellcat! — is that superheroes shouldn’t take themselves so seriously. She’s the antithesis to the stories driving Marvel and DC’s blockbusters, but unlike Deadpool (who’s also a critic of the superhero world that birthed him), she’s pretty PG-rated. Below, we’ve compiled a short list of the main points of Squirrel Girl’s controversy. 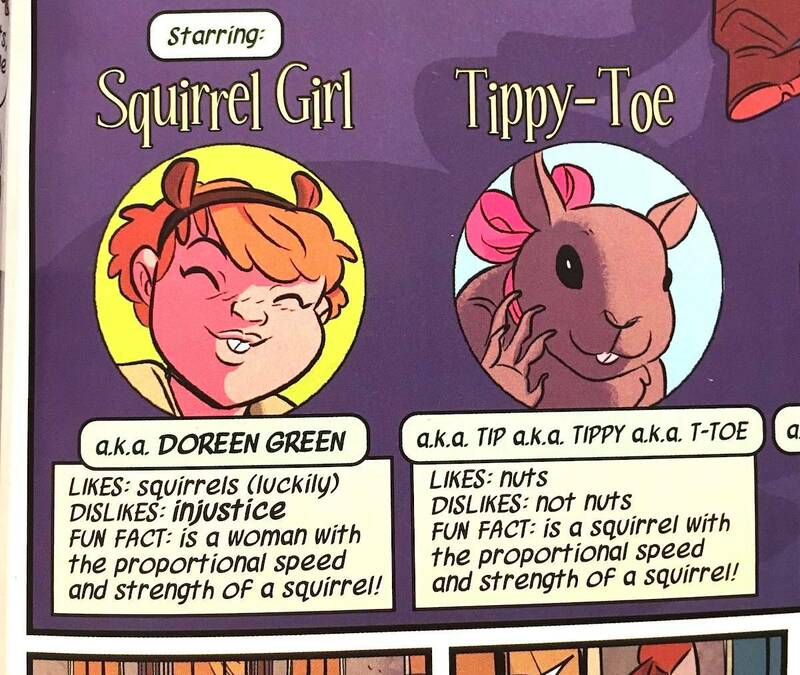 In a special standalone graphic novel published in 2016, Squirrel Girl fought an evil clone of herself. That clone’s crime was beating up all the heroes and villain in the Marvel universe. The “evil clone” switcheroo isn’t a new idea in comics, and letting a comedic character make a fool out of otherwise serious heroes isn’t new either (see any conversation Deadpool or Howard the Duck has with the X-Men or Avengers). However, something about Doreen Green’s victories confuses readers. She even “defeats” some supervillains without the help of her evil clone, as in the case of Galactus, Thanos, and Doctor Doom. She convinces Galactus not to eat the Earth by helping him cope with loneliness, and Thanos still insists she actually beat up her clone. Doreen didn’t exactly beat up Doctor Doom, though Tippy Toe and her other squirrel buddies distracted him hilariously, to the point where he just rage-quit his own evil scheme. Like Deadpool, Squirrel Girl is perfectly aware of every superhero’s history. She’s not an extra-textual character like Wade Wilson, but instead is an obsessed superfan, much like Ms. Marvel (another new hero hated by a certain group of Marvel readers, though Kamala Khan’s opposition is based in Islamaphobia). When Doreen encounters a villain she’s never fought before, she consults the Pokédex-style index cards Deadpool made for her. It’s notable that one of Squirrel Girl’s many allies is a transgender character who goes by Koi Boi. Koi Boi wears a binder underneath their costume, though their sexuality isn’t explicitly described or debated in the comic. Of course, Marvel’s newest political comic, Secret Empire and its Hydra agent leading man Steve Rogers, aka Captain America, has angered readers on the other side of the political spectrum. Why — many readers and critics have been asking author Nick Spencer on Twitter — are Captain America’s Nazi sympathies now canon? And why was 2017 the year to write this particular storyline? Squirrel Girl remains unaffected by the Hydra takeover in the Marvel universe, just as she largely stayed out of trouble during Civil War II. Still, she’s a sticking point for conservative readers, although she didn’t replace a male hero and wasn’t invented during the last few years. One could argue that Squirrel Girl doesn’t say anything more disrespectful to Marvel’s elite heroes than Deadpool routinely does. The difference is, while Deadpool flirts with other superheroes Bugs Bunny-style, Squirrel Girl just idolizes them for their tech, or else wants to befriend them. There is no release date set for Marvel’s Squirrel Girl TV series.